I feel like I just need to write a post. Even a dumb post. And then maybe my writing mojo will come back. I wish I would make this blog more of a priority because I love looking back at Paul's monthly posts and remembering those times. Tomorrow I am going to write Charlie's 9/10 month old post. Because he's almost 11 months. So that seems about right. We are doing well. We are busy. Our jobs are busy. Our two boys are very busy. Our house is always messy but we are happy. Very happy. So onto the meat of this post. Ankle boots. Yay or nay? Seriously this is what I am writing about. I saw these at Target and tried them on, but I wasn't wearing the right pants so I wasn't sure. But when I seem them around town I like them. Okay, that's all I can do. Better tomorrow, I promise!! 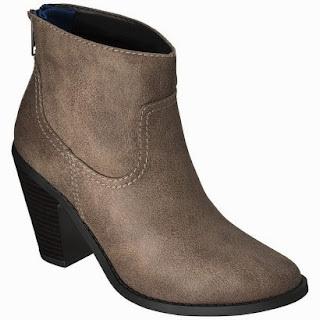 I have some ankle boots from last year that i really like- but I agree its crucial to have on the right pants... And like show a little ankle skin between skinny jean and ankle boot, which admittedly might be harder to tolerate in Denver than Austin.